The Coonstar is a Pet based on a tanuki that comes in a Yellow variety. Coonstars have a large star on their foreheads with additional smaller pink and green stars in their manes. They are predominantly yellow with brown fur tipping their tails, around their eyes and snout, and covering their ears, chest, front legs and lower back legs, and white fur in on their snout, mane, and inside their ears. 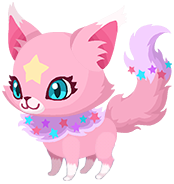 The Leostar is a Pet based on a lion that comes in a red variety. For this reason, their bodies are covered in fine red fur, save for their manes and the tips of their tails - which are dark brown in color, while their paws, muzzles, and eyelids are light tan in coloration. Leostars earn their namesake from the large stars which adorn their upper leg, interior ear, tail, and middle forehead. The Bunmoon is a Pet based on a rabbit that comes in a purple variety. The Bunmoon have large floppy ears, large yellow eyes, and a fluffy tail with matching mane around their necks. While predominantly purple, the Bunmoon have white fur covering the lower half of their faces, their underbellies, as well as their feet. Furthermore, while the Bunmoon earns its namesake from the moon in the middle of their foreheads, they also have stars adorning their manes and situated above each of their feet on the front of each leg. This page was last edited on 21 April 2019, at 18:54.